Rolls-Royce partnership A $33 million strategic alliance will support key research on aircraft engines. A $33 million strategic alliance will support key research on aircraft engines. Purdue and Rolls-Royce have launched a $33 million joint effort for research on crucial components of next-generation jet engines. Announced in April, the five-year strategic partnership will create a Rolls-Royce University Technology Partnership center at Purdue that initially will focus on advancing compressor design and thermal management for these engines. "Purdue has always been a great partner with Rolls-Royce and I am confident that our collaborative research will result in strong long-term advances in jet engine development," says Phil Burkholder, president of Rolls-Royce Defense Aerospace, North America. "We're very happy to have such a world-class university just up the road from us, and we're very pleased to see this increased recognition of the strong relationship," adds Lisa Teague, head of Rolls-Royce Research & Technology in Indianapolis. "This agreement takes our partnership to the next level," says E. Daniel Hirleman Jr., Purdue's chief corporate and global partnerships officer. "The university has talent and ideas, and Rolls-Royce has technology and the understanding of future needs in aircraft propulsion. We carefully looked at where Rolls-Royce and Purdue together could go, and chose these two areas that are critical to next-generation engine technology." Purdue brings to the table a unique set of resources for research on jet engines. Prime among them is the Maurice J. Zucrow Laboratories, the nation's largest university propulsion laboratory, whose capabilities include large gas turbine engine test rigs that can operate at full-scale temperature, pressure and flow conditions. Last year, Lilly Endowment Inc. contributed $5 million to an $8.2 million expansion of the lab, which will include a new building with turbine test facilities. "Our research in the Zucrow Labs has grown in recent years, mainly through the industrial partnerships," says Stephen Heister, Zucrow director and the Raisbeck Engineering Distinguished Professor for Engineering and Technology Integration. "We're proud of that. We're providing research results that allow industry to put better products in front of customers. Our students want to be involved in high-profile activities with global corporations. Certainly Rolls-Royce is among our strongest partners, and it's great we have jointly signed up for a long-term vision." Rolls-Royce was the first company to announce plans to move a research group into the Purdue Research Park Aerospace District, which incorporates the Zucrow Labs and the Purdue University Airport and was formed last year. 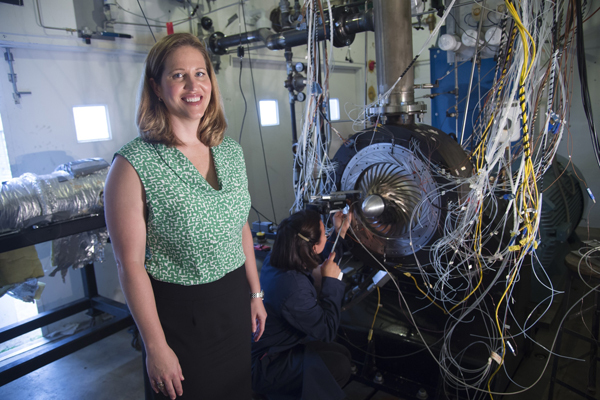 Nicole Key, professor of mechanical engineering and aeronautics and astronautics, leads propulsion research aimed at reducing fuel consumption and emissions for next-generation jet engines. Key is assisted by master’s student Jeanne Methel. 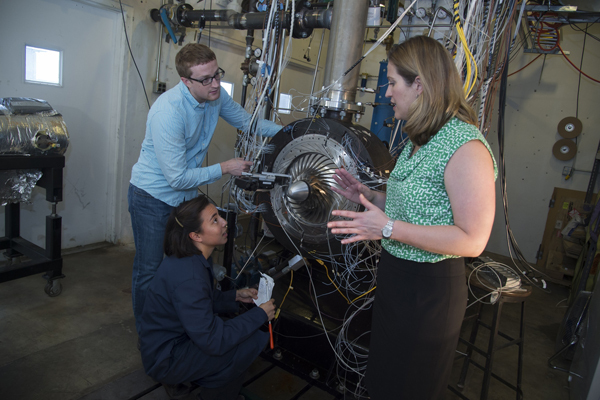 "The future of jet engines is higher and higher overall pressure ratios," says Nicole Key, associate professor of mechanical engineering. "You end up with physically small airflow areas at the back of the high-pressure compressor, before the flow goes into the combustor. "Better propulsive efficiency and better thermal efficiency are driving you to this 'small-core' design," says Key, who is director of the advanced compressor research project. (The core of a jet engine consists of the compressor, the combustor and the turbine downstream of the combustor.) "It's better for the environment and better for the bottom line of the aircraft manufacturer." However, she says, this design approach brings many questions in how to manage flow in the compressor to keep both high efficiency and sufficient stall margins. Beginning in 2011 with a National Aeronautics and Space Administration project, Key and her colleagues have developed techniques for flow measurements in small-core compressors. This has been no small challenge, especially given the difficulties of gathering data in certain areas of the unsteady flow fields. "We now have a good set of tools to investigate the flow physics," she says. "The flow in the endwall regions has a profound impact on small-core compressor performance." 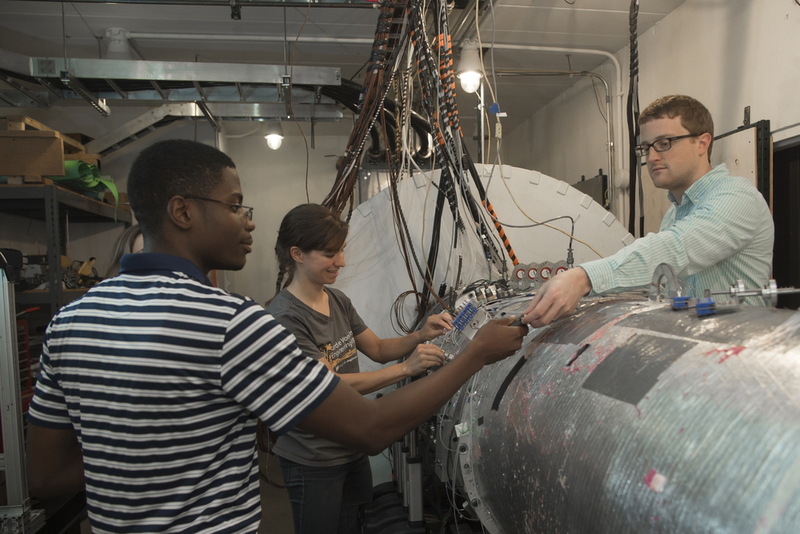 The second Rolls-Royce-sponsored project, on thermal management issues in jet engine design, is an outgrowth of work at a University Technology Center (UTC) that the company established with Purdue in 2003. "We're finding ways to allow parts of engines to run hotter or to manage heat," says Heister, who leads the thermal management work. "Initially the UTC was focused more on military applications and very high-speed vehicles, but two years ago we shifted focus to be more general. Commercial aircraft have a lot of the same issues. As we build engines that are higher and higher pressure, parts get hotter and hotter and we have greater need for cooling. "Fuel is the main coolant in many of these systems, so we look at ways to enable more heat transfer to the fuel, or ways to mitigate the fuel breaking down if the temperature gets too high, for example," he says. Key also directs the advanced compressor research project at Purdue, a partnership with global engineering, designing and advanced technology manufacturer, Rolls-Royce. Key is pictured with master’s student Jeanne Methel and postdoctoral researcher Reid Berdanier. A Purdue graduate was the first employee of engine entrepreneur James Allison, who founded the precursor to Rolls-Royce's Indianapolis operation in the early 1900s. The Indianapolis center, which builds engines for aircraft and other applications, now employs almost 1,400 engineers. About 600 Purdue alumni work at various Rolls-Royce groups worldwide. "At Purdue, we're working with the next generation of PhD, master's and undergraduate students as well, getting them ready to work on the right problems at the right time," Hirleman says. "We think we educate extraordinary talent. And when the projects are done and sponsors such as Rolls-Royce review the results, they generally have first shot at that talent. "These industrial partnerships provide the research context, the impact and the transformative learning experiences for students," he says. Moreover, he emphasizes, without such collaborations Purdue would not be able to do this type of research while maintaining affordability and accessibility for its undergraduates. "Rolls-Royce was my first sponsor when I started my faculty job, and the relationship has only grown," Key says. "For me, it's been a natural fit. Now the results of our experiments will directly affect new engine design concepts. It's very exciting to be able to contribute and have a direct and immediate impact on the development of these engines." Key also enjoys the ability to engage with Rolls-Royce's network of other university teams who are contributing to the next generation of engines. "Rolls-Royce really values those partnerships," she says. "Being part of that network allows us to interact with great researchers at universities all over the world, which is an added bonus."